There is an investment vehicle that one can purchase to ride the wave of green companies that will make untold fortunes. 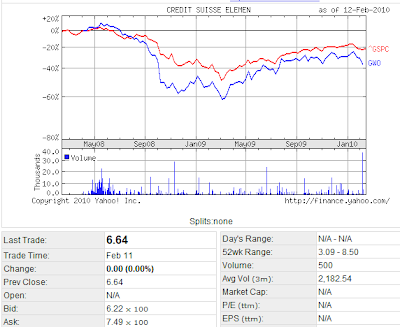 One such investment vehicle is Credit Suisse's GWO, a global warming index fund. (see chart below, where the blue line is GWO, and S&P 500 is the red line for comparison). A few months ago, I began wondering if an index for global warming stocks existed, and if it did, how it was performing. After all, with the Copenhagen summit all but done with the countries of the world signing on to a world-wide agreement to cut CO2 emissions from burning fossil fuels, and the IPCC giving the world peer-reviewed report after report explaining exactly how the world was over-heating, this appeared to be a slam-dunk for making money hand over fist. So I went looking. And found GWO, an offering from Credit Suisse. There is a chart for GWO, as shown above from one popular finance site, finance.yahoo.com. One can also input GWO into the stock finder on other finance sites and a similar chart shows up. If using finance.yahoo, about ten choices show up after inputting GWO. Choose the one that reads "GWO Elements CS Global Warming ETN." The blue line on the chart above is for GWO, the red line is for S&P 500. There was a big drop (60 percent of value) around September 2008 for GWO. That coincided with the recent financial crisis, when most stocks dropped quite a bit (around 40 percent). Still, why did GWO drop half again as much as the S&P? My thought is that investors know that the global warming issue is only viable with a robust economy - else nobody is interested in hobbling their economies with global warming regulations. Except, apparently, in California, where AB 32 continues to be implemented by the State, without regard for the unemployment and increased costs of all goods and services in California. Then GWO climbed a bit, as did the S&P, almost hand-in-hand. Until January, 2010, when GWO began a steep drop. One can only wonder why the drop occurs now, and could it be due to Climategate, the revelation that the entire global warming issue is based on false data, made up data, cozy peer-review that excludes dissenting views, and my small contribution, the Abilene Effect. (The Abilene Effect shows that there was no warming, but there were some very cold winters all in succession around 1976 to 1980, creating a statistical appearance of a warming trend where there was actually none). One wit famously said, "follow the money." In this case, if man-made global warming were true, if it were based on sound science rather than hopes and wishes, then the GWO price should be zooming. Clearly, it is not. UPDATE 1 -- Yet another global warming fund is PowerShares WilderHill Clean Energy (ETF), stock ticker PBW on the NYSE. This fund actually is more popular than GWO above, as it has more volume traded daily. However, PBW's performance is even worse than GWO. PBW fell farther (approximately 40 percent more) than did GWO. I'll figure out a way to put a chart on here, illustrating how PBW fell from a higher peak (approximately $23 per share down to approximately $6.60 before climbing back up to approximately $10 per share today) and therefore is a worse investment than GWO. PBW lost almost 75 percent of its value and is now slowly increasing. As with GWO, one would expect that PBW would be zooming as savvy investors put their hard-won money into a sure-thing, companies that will make and sell goods and services that are much in demand in a world toasting and burning due to man-made global warming. Apparently not. (NOTE: The stocks comprising GWO are from companies world-wide). 11. CF Industries Holdings, Inc.
12. Chicago Bridge & Iron Co. N.V.
16. Dowa Holdings Co., Ltd.
31. MEMC Electronic Materials, Inc.
34. Nissan Chemical Industries, Ltd.
40. The Shaw Group Inc.
45. Suntech Power Holdings Co., Ltd.